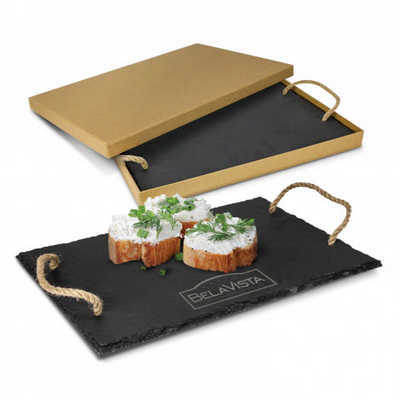 Deluxe natural slate serving board with four soft non-slip and non-marking polyurethane pads on the base. It has natural hemp rope handles and is beautifully presented in an unbleached cardboard gift box. Colours: Grey. Dimension: W 300mm x L 200mm x 5mm. Print Description: 150mm x 100mm. Print Type: Laser Engraving. Packing: Natural gift box. Price includes : Engraving Per Position. Setup is included.